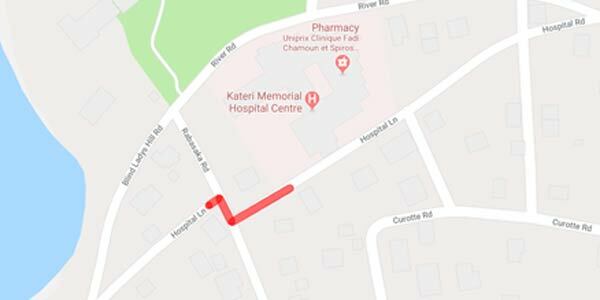 The Public Safety Unit of the Mohawk Council of Kahnawà:ke would like to inform road-users that it has received information about several recent vehicle incidents on the road directly behind Kateri Memorial Hospital Centre, dubbed Hospital Lane on Google Maps (see map below). The road is very narrow and there is a sharp ′Z-turn′ at the junction of Rabaska Road. There have been a number of ′near-misses′ with vehicles heading eastward from the Onake Paddling Club area and turning onto Rabaska Road. It is believed that an increase in traffic in this area may be a result of drivers avoiding the traffic lights in front of the Hospital. Drivers are asked to extremely vigilant when travelling in the area. For further information contact the Public Safety Unit at 450-632-0635.